The following is list some of the backpacking trips I have done in the Great Smoky Mountains National Park. I will add information on other hiking trips as soon as possible. Unfortunately it's pretty hard to find many good loop trails, so we usually end up backtracking some trails or we have to arrange for a car a the pick-up point. While all of the trails allow for foot traffic, some designated trails can be used by horseback riders. 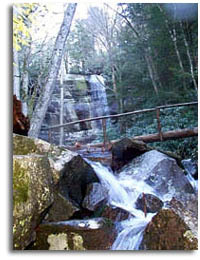 We also have information on some day hikes in the Smoky Mountains. Reservations are required for all backcountry campsites and shelters and can be made by calling (865) 436-1231. Miles listed are in round trip or total miles for the trip listed. Click on the trail name for additional and photos for that trail. Trail ratings are completely subjective so the listed rating is based on my experience with these particular trails; E = easy, M = Moderate, S = Strenuous. Weekend trip - 25 foot waterfalls located off of the Cades Cove, tent camp. Hike the Smoky Mountain Section of the Appalachian trail. This trip can also be cut in half making a 3-4 day trip. Loop hike - flexible hike that lets you stay at either a shelter or tent site. Overnite trip - Hike 4 miles of Appalachian Trail and stay in a bear shelter. requires reservation.